Can I post multiple blogs in one day? Well, I'm going to. I know I promised to talk about Paris and Rome ... and I will. I will! But right now I've got some other things ready to come spilling out. I've had freedom on my mind a lot in the last several days. Last night we watched Farmageddon (I highly recommend it - especially if you learned something from Food Inc ... and more so if you are afraid to watch Food Inc) ... and it reminded me that we are in danger of loosing the freedom we so cherish as Americans in subtle ways that, at first glance, appear to be in the name of the greater good. I won't get into the state of our souls ... that's very individual and between you and God, not for me to tell you (though I highly recommend having a conversation with Him about it, often). But with these things that are happening to small farmers in many states, under the name of food safety, and at the hands of government agencies, we really need to think about why we are allowing the government to make these decisions. Do we want them to? If not, what are we going to do about it? Do many Americans make bad choices when left to our own devices? Of course! Some people may choose to eat McDonalds three times a day ... or survive on vending machine food ... or simply overeat. It's horrible; it is bad for your health (among other things). However ... this is the United States of American ... land of the free and home of the brave. Land of the free. You get to decide. I believe it should continue to be that way. Before you say "But we can't because of the rising cost of healthcare due to these people's choices!" Well, that's a whole 'nother thing. I also don't believe our health is the government's business ... or responsibility. If you do, perhaps those that have made a choice to rely on the government (and taxpayers) should be held accountable for their decisions. I know the example has been used before but I'll use it again; if I choose certain careers, I'm going to be expected to perform in certain ways (physical fitness tests, performance expectations, conduct expectations, etc) and if I fail to do so, I'm no longer compensated. If you are giving the government responsibility for your health, perhaps they should have a say in what you are consuming. But that should be a choice. We (Tim and I) aren't choosing to rely on the government for healthcare. So in my mind, the government should not be able to tell me what medicines to take, what my medical care looks like (including the birth of our daughter! ), or what I eat. Which is what Farmageddon is all about. 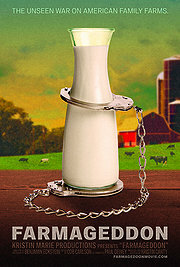 You don't have to have a burning desire to drink raw milk to want to protect someone else's right to make that choice. Just empathize ... put the shoe on the other foot ... what if the government said you had to drink raw milk, and pasteurization and homogenization of milk were now illegal ... but you feel pasteurization is safer and that homogenized milk is more palatable? You deserve the same right to choose what you will drink. So what can we do? Of course there is the old "Get out and vote!" answer. You should already be doing that. Men (and women) died so that you can do that. Register. Get your voter card. Spend some time away from your TV/Facebook/Youtube and invest in the future by getting to know your candidates. I don't mean attending $20,000 a plate banquets ... but do some reading and research. Find out which one believes the same way you do on most of the issues. And please! Please. 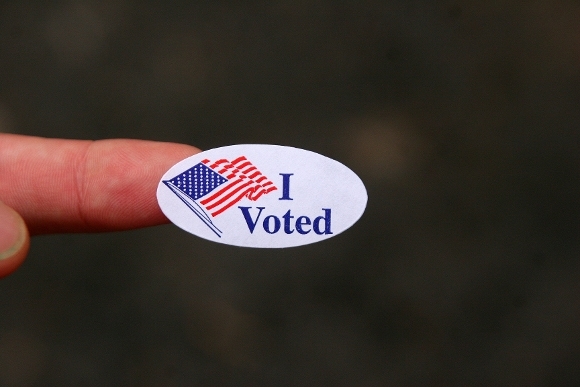 Don't straight-ticket vote, and don't pick one or two pet projects to base your vote on. There is so much more going on each year than the headline grabbing controversies ... don't be distracted from the subtle ways your freedom may be disappearing unnoticed until damage has been done. What more can you do though? Once you have a candidate in office (even if they aren't the one you wanted) public pressure can still influence their votes and what issues are brought to their attention. Vote with your dollars! I know the economy is tough, and food raised humanely and as God designed, clothes that are sewn here, (I could go on and on, and am guilty of not always letting my heart influence my budget) are more expensive ... but perhaps instead of a large quantity of cheaply grown/manufactured food and items ... if we all invested in a higher quality product produced fairly ... the infamous "they" would be less motivated to continue on the destructive path we're currently on. I alluded to it above, but support your local farmers and artisans. Ok - I live in Austin, Texas which seems sometimes to be the very epicenter of "buy local" (Keep Austin Weird!) and it is possibly easier here than elsewhere. But farmer's markets are becoming more popular all over. Go buy some "real food" and talk to the farmer who grew it. Find out what issues that family or individual may be having, and help be a voice for them. The number of farmers in America is drastically less than it used to be, and like the Whos in Whoville, they need help in raising their voices to be heard. Yeah, I did - I pulled out Dr. Suess thank-you-very-much. Tim and I dream of working on the family farm together. After the movie last night, he looked at me and said "Are you sure you want to do this?" This makes me want to do it even more! I will not be intimidated into turning away from what I think is right and best for my family. Especially with Shelby Hope on the way in a few short months. I will fight for her to have the freedom I've enjoyed. I will not idly stand by and watch the way of life I hope would be available for her to choose when her time comes disappear. I know it won't be easy to stand by as her mother and watch her make her own choice - but I want to equip her to do that. And I want our government to remember what America was founded on and extend her people that same respect. No, this isn't just about food, but as one of the greatest of Maslow's hierarchy of needs ... it's a great place to start.